After previously telling both Gizmodo and The SF Weekly that the San Francisco police had no record of being involved, SFPD spokesperson now tells The SF Weekly that "three or four" officers did in fact take part in a July search of Calderón's home. However, these plainclothes officers apparently did not enter the premises. Seriously, What the Hell Is Up With This Missing iPhone? "When they came to my house, they said they were SFPD," Calderón said. "I thought they were SFPD. That's why I let them in." He said he would not have permitted the search if he had been aware the two people conducting it were not actually police officers. So in essence, the SFPD came over, flashed badges, seemingly made threats, and then stood by while private citizens searched the Calderón home. Oh, and then they conveniently forgot about it. Yet, it's still not clear exactly who questioned Calderón and his family's immigration status (they're legal) or why. Nor are we clear on whether or not officers were there in an official capacity. Obviously, much in this story is still developing. 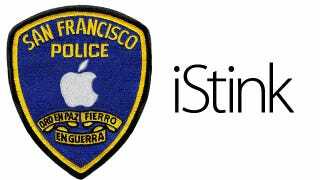 Which clears up why the police showed up and why there was no report filed, but it doesn't exonerate the SFPD from allowing Apple to conduct a search under false pretenses.